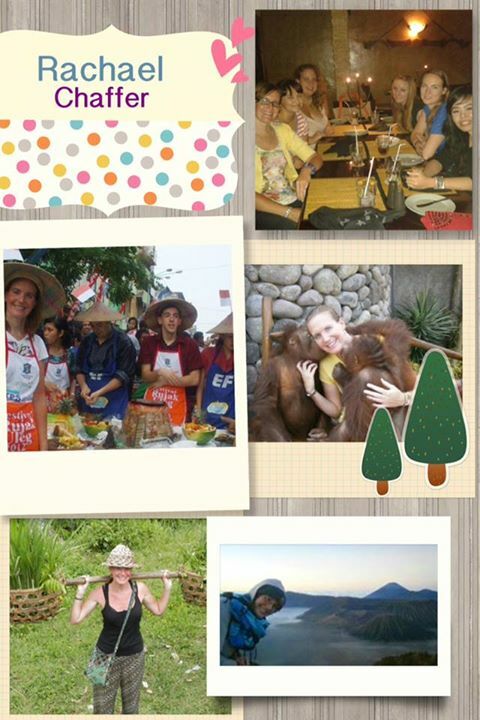 We’d like you to meet one of our Senior Teacher from EF Bukit Mas, Ms. Rachael Chaffer. She’s been with EF Surabaya for three years. Indonesia came to her mind because of its great beaches, hot weather and so many different food. She loves Surabaya as it is a great base from which she can travel to lots of amazing destinations. It’s got lots of malls for shopping, eating out etc where she can buy really cheap but delicious food from street vendors. It lacks a little in cultural things, but it’s much less polluted and has less traffic jams than in the capital Jakarta. She even chose Rendang as her favorite food, hmmm yummmyyy!! So far, she’s been to Karimun Jawa which she thinks is amazing, Spice Islands in Banda which brought her to a great adventure and some small islands in off Flores which were beautiful and still many more. The most memorable experience during her travelling in Indonesia was a road trip to Ijen was great fun despite taking 14hrs instead of 7hrs. “Climbing the Api volcano in the Banda Islands was well worth it when we got to the top.” she said. And swimming with sharks in Karimunjawa was good if not a little daunting. One of our long term team members Rachael Chaffer, who has been with us for over 4 wonderful years, was leaving and a fellow teacher from Bukit Mas, Henny Gorton, shot her farewell video. It catches a glimpse of Rachael’s daily life in Surabaya, which pretty much shows the average days in Indonesia. All our full time English teachers will complete a personalised 3 month TEFL course and be awarded a TEFL certificate. This course is offered free and you will be paid your regular salary throughout the EF Indonesia TEFL training course. For more details of our unique study and teach opportunity, visit our EF Indonesia TEFL course page.